If the music that we once referred to as “Smooth Jazz” had its own Mount Rushmore, surely one of the albums on it would be Double Vision; Bob James and David Sanborn’s classic. It represented what was good about that oft maligned genre – yes the tunes were hook-laden but because of who was involved the musicianship was first rate. Double Vision still has a place in the collection of many people who would not be considered Smooth Jazz aficionados. Believe it or not, it’s now been 27 years since Double Vision. Though James and Sanborn have occasionally crossed musical paths on other people’s projects, they had not recorded a follow up to that first extremely lucrative album. That changed when in December 2012, the duo got together again in New York to record the sessions that comprise Quartette Humaine. Let’s get right to the point, those expecting this essentially to be Double Vision II, will be in for a surprise. To be honest, the musical landscape has changed considerably in three decades; Smooth Jazz is no longer the commercial titan that it was in the ‘80’s, which in many ways has freed musicians to pursue diverse creative pathways, as James and Sanborn have here. First: gone are the keyboards, synthesizers and guitars that were so popular 30 years ago. This is an all acoustic set – James on piano; Sanborn on sax, mostly his trademark alto; Steve Gadd has returned on drums and James Genus, of SNL Band fame, plays the acoustic bass. Second: due in large part to the instrumentation, the sound of Quartette Humaine is decidedly less slick than its predecessor, successfully walking a fine line between classic and contemporary jazz. James and Sanborn said that they had in mind the work of Dave Brubeck (who ironically, passed away a week before these sessions) and Paul Desmond with their classic quartet, when they conceived this album. I think that it’s a very apt comparison. The sound they have achieved I liken to a present-day version of that great group – serious enough to attract many straight-ahead jazz fans but still accessible enough for much of the general public. The album kicks off with a selection penned by James, which may have been intended as an overt tribute to Brubeck, “You Better Not Go to College”, a possible allusion to the fact that much of Brubeck’s early fame came from his numerous appearances on campuses around the country. This tune is my favorite on the album, with its light Brubeckian swing, propelled by Gadd’s brushwork and Genus’ insistent bottom. Over this bed we get James’ block chords and Sanborn’s alto, which in its trademark plaintive wail is completely different from Desmond’s “dry martini” sound, nevertheless, Sanborn manages to capture Desmond’s overarching humor. “Geste Humain” gives James a chance to remind us how great he is at playing a gorgeous melody. It sounds like an excellent outtake from a Fourplay album. “My Old Flame” is the only standard on the album; it’s taken at an easy shuffle tempo which fits the song and the musicians well. “Deep in the Weeds” is the most Double Vision-like track on the disc, a mid-tempo funk workout, with Sanborn blowing a hot solo over Genus and Gadd’s insistent beat. In fact, the unsung heroes of this album just may be the rhythm team. They set unique and consistently interesting frameworks that inspire the pianist and saxophonist towards doing something more inventive than conventional Smooth Jazz licks. Quartette Humaine is a fine follow-up to James and Sanborn’s classic first meeting. It’s one of the best efforts by both leaders in a while and a great way to help revive the legendary OKeh Record Label. 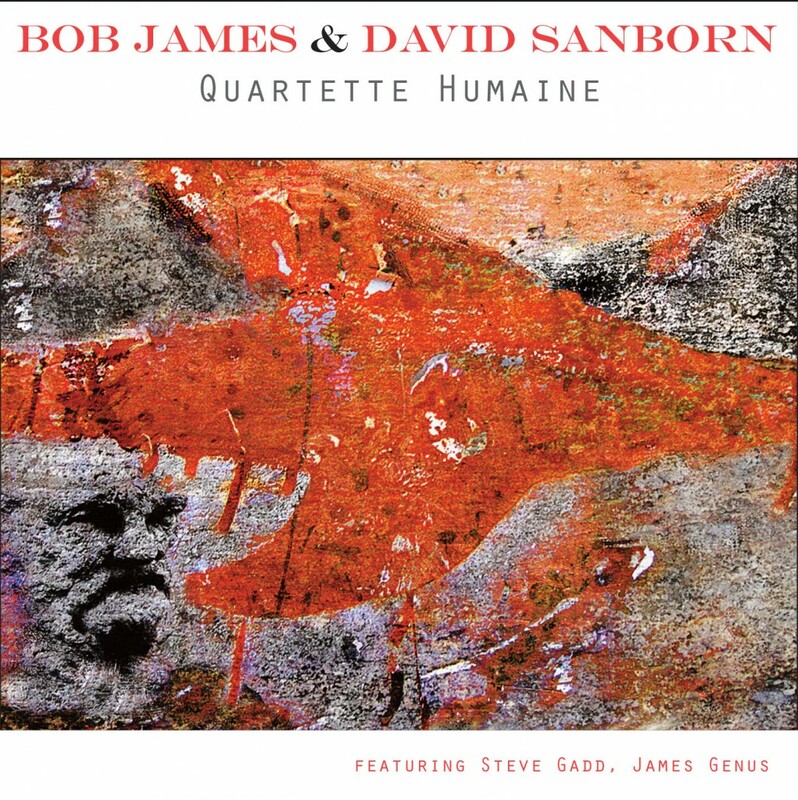 This entry was posted on July 10, 2013 at 9:42 pm and is filed under CD Reviews with tags bob james, david sanborn, quartette humaine, smooth jazz. You can follow any responses to this entry through the RSS 2.0 feed. You can leave a response, or trackback from your own site.